This question was easily answered in the Jewish tradition of Jesus' time - someone of my own clan, tribe or family. Certainly not an enemy. Not so, said Jesus. It is even, perhaps especially, your enemy, the downtrodden and the outcast.. In this Sunday's Gospel (Luke 15:25-37), Jesus is tested by a religious lawyer about how one merits eternal life. In Jesus' response, he shows the true nature of God's mercy, which we are all to emulate. 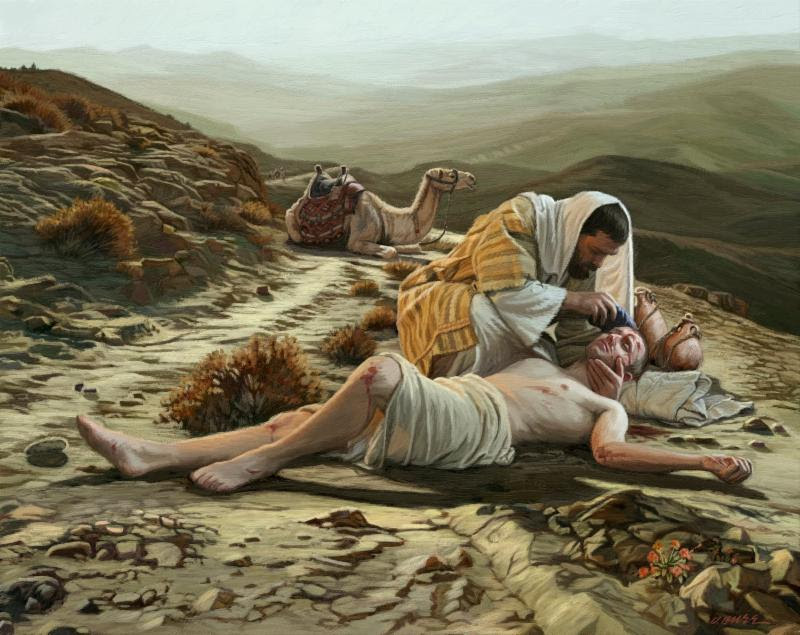 Jesus placed the despised Samaritan as the hero in his story, in contrast to the Jewish priest and the Levite who were following Jewish custom and law..
"Jesus replied, 'A man fell victim to robbers as he went down from Jerusalem to Jericho. They stripped and beat him and went off leaving him half-dead. A priest happened to be going down that road, but when he saw him, he passed by on the opposite side. Likewise a Levite came to the place, and when he saw him, he passed by on the opposite side. But a Samaritan traveler who came upon him was moved with compassion at the sight. He approached the victim, poured oil and wine over his wounds and bandaged them. Then he lifted him up on his own animal, took him to an inn, and cared for him. The next day he took out two silver coins and gave them to the innkeeper with the instruction, 'Take care of him. If you spend more than what I have given you, I shall repay you on my way back.' Which of these three, in your opinion, was neighbor to the robbers' victim?' He answered, 'The one who treated him with mercy.' Jesus said to him, 'Go and do likewise.'" Our first reading (Deuteronomy 30:10-14) highlights the simplicity and purity of God's law as originally transmitted by Moses. It is already in our hearts; we have only to carry it out. "Moses said to the people: 'If only you would heed the voice of the LORD, your God, and keep his commandments and statutes that are written in this book of the law, when you return to the LORD, your God, with all your heart and all your soul. 'For this command that I enjoin on you today is not too mysterious and remote for you. It is not up in the sky, that you should say, 'Who will go up in the sky to get it for us and tell us of it, that we may carry it out?' Nor is it across the sea, that you should say, 'Who will cross the sea to get it for us and tell us of it, that we may carry it out?' No, it is something very near to you, already in your mouths and in your hearts; you have only to carry it out.'" In our Epistle reading (Colossians 1:15-20), St. Paul refutes the false teachers of his day (and as yet in our day) by reminding his listeners of the primacy of Jesus, the "first born of all creation". It is this same God who was the giver of the Mosaic Law as it was the teller of the parable of the Good Samaritan. "Christ Jesus is the image of the invisible God, the firstborn of all creation. For in him were created all things in heaven and on earth, the visible and the invisible, whether thrones or dominions or principalities or powers; all things were created through him and for him. He is before all things, and in him all things hold together. He is the head of the body, the church. He is the beginning, the firstborn from the dead, that in all things he himself might be preeminent. For in him all the fullness was pleased to dwell, and through him to reconcile all things for him, making peace by the blood of his cross through him, whether those on earth or those in heaven"
It really is that simple, we should not over complicate it, It is already "in our mouths and in our hearts." We have only to carry it out.